You are here: Home / Sew-cializing / Pattern Pyramid Give-Away! Woo hoo!!! I finally got to be involved in the Pattern Pyramid! I have been involved in the online sewing community for almost a year (a blog lurker for longer than that) and have seen many a giveaway pass me by, but, finally, I won! The pattern pyramid concept was crafted by Karen of Did You Make That? and then amended for those of us who use the upper sizes, by (I believe) Beverley of On the Road to Sew Wear and it has now been passed on to me by the vivacious and witty Anne of Pretty Grievances. All of these patterns are sized 16 and up and after choosing my faves, I’ll go through my pattern stash and add some more and send them on to the next lucky recipent. It probably was not a good idea sending patterns to a pattern hoarder…. 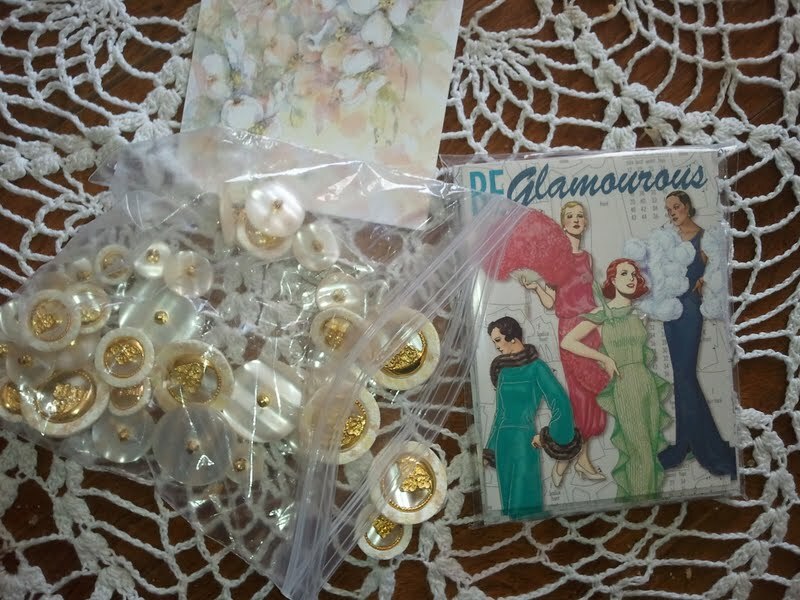 I buy patterns nearly every time they are on sale at Joann’s and have been recently getting into buying vintage patterns on etsy and ebay. I have quite a collection now….. However, I know I have many that I can pass on that someone can love and ACTUALLY USE instead of sitting in my pattern bins…. I’m not sure yet what I will keep, but that red Donna Karan dress has caught my eye as well as the Sandra Betzina blouses. Some of these patterns I already have, so I obviously don’t need those! My pledge is also to add in more than I am going to take. 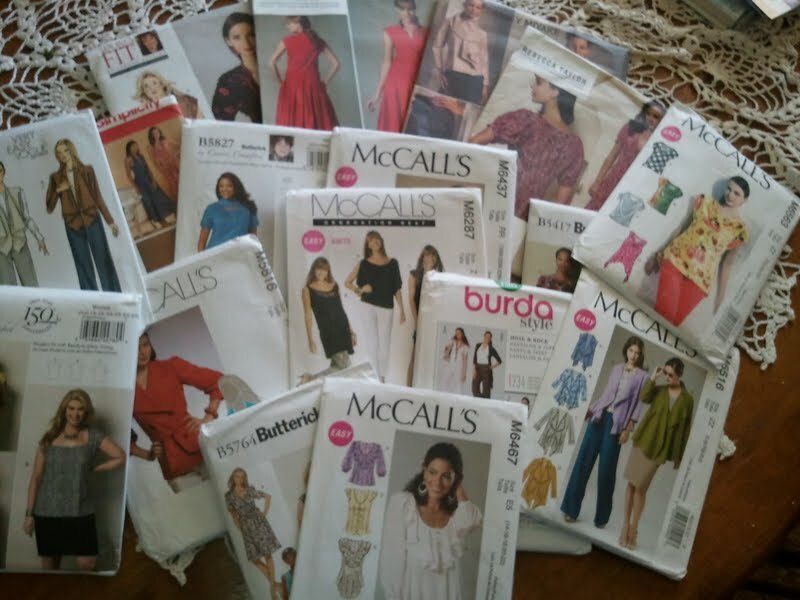 If I can weed clothes out of my closet, I can definitely weed some patterns out of my stash! Now what? Well…. I’d say it’s time for a giveaway! I’ve never done a giveaway before and not sure how many takers I will have, but here goes! I will send this to anyone, anywhere in the world. Just comment here on this blog post from now until Friday, October 4, 2013 at midnight PST. I will then choose a winner by some random way probably using a dog (Anne has set the bar high for this one!). Each winner will pick a selection of patterns to keep for themselves, then host their own giveaway throwing some new choices into the mix and then send the patterns to the next person who was randomly chosen. All patterns are in the plus size category – ie – if the pattern comes in 2 sizing groups, then it will be the larger category. Patterns to go up to at least go up to a size 20 (most go higher). Patterns listed as “all sizes” will include plus sizes. You must be be happy to post patterns worldwide. 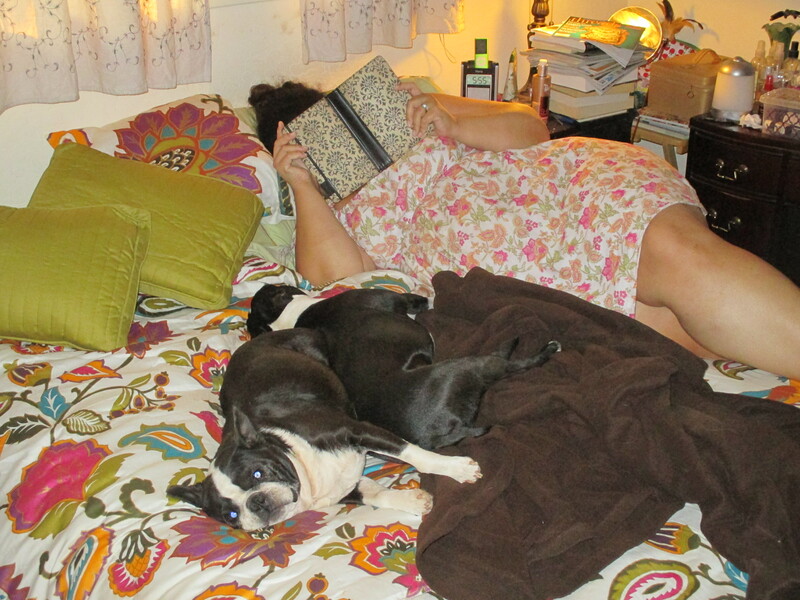 PS Don’t you like how my dress nearly matches the bed? Or how little dogs get most of the bed to lay on? How lovely to win so many patterns. Do count me in for the pattern pyramid. Selfish thing that I am, I immediately went, ‘ooh- new patterns….’ Enjoy! Haha! I’m the same way! I guess I chose some that you just put in! That’s awesome to know that this one has also been to you! I chose about 5 I think and replaced with 7. It sure was hard to decide on both ends! I am definitely in! I have a daughter who wears larger sized patterns and I love to get new patterns and have so many that could use a new home. Love the pups! A house without a pet is not a home and a bed without a pet is lonely! I would love to be included in the drawing for the pattern pyramid! Yay! PS Your dogs are so cute!